Yesterday I finally watched a mystery film that has been on my radar for a while now. ‘The Limehouse Golem’ is a crime story set in Victorian England. Bill Nighy plays a Scotland Yard detective that is trailing the elusive culprit of a series of grisly murders. The cover art may remind you of straight to DVD schlock, the synopsis may sound formulaic but make no mistake, this is a gem. Let’s explore what makes ‘The Limehouse Golem’ so impressive. There is no dead weight in this film as far as acting. Bill Nighy brings his cinematic magic to the role of Detective Kildare. That Shakespearean growl never fails to intrigue and invoke emotion. Though Nighy is usually a paternal figure of responsibility, this mystery has him feeling like a lost boy at times. You can see realisation dawn on his face and flicker through his eyes. This expression is utilised brilliantly in the film’s climax. Much of the tension is built by the nervous energy of the cast, their eyes anxiously flicker around the room. It’s almost as if they are looking out for the killer. The best performance though, came from Olivia Cooke. I knew she was good when I first saw her in ‘Bates Motel’ but she is a revelation in this, especially in the finale. More on that later. The characters tread the cobbles in an interesting vision of Victorian London. The skyline and the alleyways look like a facade. They look like a set. Perhaps this is a deliberate choice, theatre is at the heart of the tale and clearly adored by the writer. It is obvious that theatre is important to the director too because the scenes inside the playhouse are lovingly shot. The general audience fade into one but the important characters in attendance stand-out. This gives scenes inside the theatre a dream-like quality. The sets and stylised visuals contribute to the escapism of the film. 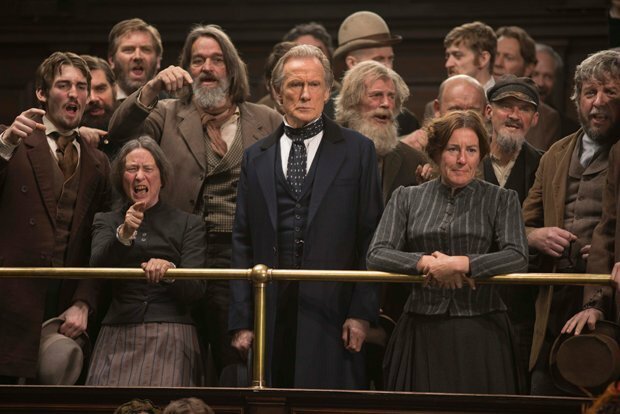 ‘The Limehouse Golem’ hooks you in with its storytelling. Three typical suspicious creeps are established as the potential killer. In a less innovative Victorian story they would each be a possible suitor for narrator, Lizzie Cree. Instead, she gives each of them a motive for performing the gruesome serial murders. In a masterful final act, she reveals that she was The Golem all along. The story is an education in unreliable narration as we completely empathised with her only to find out that she was utterly evil, hiding in plain sight. Cooke’s performance in the big reveal was chilling. It was unnerving the way she watched Kildare through the mirror while he figured it out. Flashbacks showed her carrying out the murders with an unnerving malice. That sequence has really stuck with me. Kildare is a Victorian detective with a trusty partner so it is easy to draw the Sherlock Holmes comparison. What sets him apart from Holmes though is his humanity which proved to be his undoing. He cared too much and she exploited that. In the final scene the play group exploit Lizzie’s death for drama, recreating it on stage. This comes back to bite them when the actress playing her, a woman that slighted her, dies for real. The following shot shows her spirit, back in front of her crowd. She will always haunt that theatre. Haunting, chilling, genius.